If I want my hair to have some sort of texture (for the record, it’s pretty damn straight), literally the last thing I’m going to do is dip my head under a shower head and shampoo. Good ol’ H2O has a history of resetting my mane back to its natural state, getting rid of any wave or bend I’ve temporarily possessed from heat styling or product. 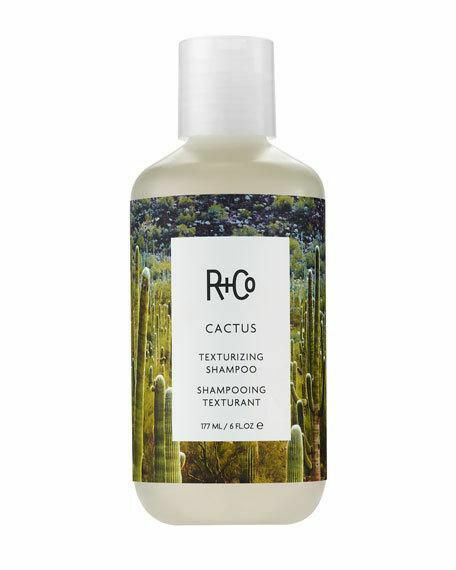 So you can see why I was immediately skeptical of R+Co's Cactus Texturizing Shampoo. It's not that I don't trust the brand's formulations (the Sunset Boulevard Purple Shampoo and Conditioner set is LEGIT and cut my brass immediately), but generally, a curling iron does a better job at giving me the "cool girl, I barely tried at all" waves of my dreams. The new shampoo tells an interesting story. It's designed with a mix of "texture-building particles," as well as an ingredient which adds grip called "Diatomaceous earth." Those two things combined work to make your waves appear out of nowhere. But it's also an interesting mix between a styling product and a shampoo, as it's made with ingredients that nourish and cleanse your scalp, as well as hydrate your locks. However, in order for it to really work, you're meant to skip the conditioner, which honestly freaked me out because bleach has done WORK to my hair and it needs the hydration. Thinking of my poor, highlighted hair, I decided to apply a conditioning mask first, rinse it out, and then shampoo with Cactus. What I experienced after was pure magic, and I'm not exaggerating. My hair looked really freaking good—like those bloggers and street style stars who seem like they rolled out of bed with effortless, wavy, textured lobs in all of their photos. After brushing out tangles, my hair air-dried with a slight bend in all the right places and waves that looked like they actually came from a day spent at the shore, soaking up all the ocean air and maybe even some salt water. And the best part about the entire process was that I didn't even need to plug in a hot tool. I can also leave my apartment or the gym with slightly damp hair and be guaranteed a good hair day—a situation that was definitely not the case otherwise. While I don't indulge in this shampoo every day (like I said, dry hair probs), I have worked it into my routine whenever I know I want waves that give off that "it girl" vibe. Trust me, you'll be feeling it.